The comparative resistance test determines the most resistant product and product locations to sterilization. It also determines an appropriate process challenge device (PCD) to be used for validation and routine cycle monitoring so product is not needed for microbiological monitoring. 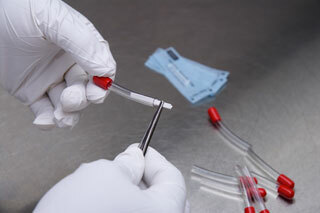 A comparative resistance test is also used to determine an appropriate sterilization cycle thanks to its ability to show lethality in the most difficult to sterilize locations. It compares the resistance of different types of BIs to determine an internal and external BI. Additionally, it is used to adopt newly developed product or devices that have undergone changes into a current cycle. The bioburden resistance test categorizes the resistance of the natural occurring bioburden on the devices that have undergone all the manufacturing steps up to but not including sterilization. This test also compares the resistance of the bioburden to the already categorized PCD. The relative resistance test is a study that includes the comparative and bioburden tests. This study is the first step in sterilization process development. This testing is required and performed according to the recommendations outlined in ANSI/AAMI/ISO 11135-1:2007, ANSI/AAMI/ISO 11135-2:2008, AAMI TIR16 and AAMI TIR28. Nelson Labs has the ability to mimic industrial sterilization cycles through the use of its seven programmable ethylene oxide sterilizers (including a BIER vessel) that utilize 100% ethylene oxide. We have also developed a wide array of PCDs of varying resistance that will be compared against the candidate product to offer our clients more options for cycle monitoring. The resistance is determined by inoculating the products in all of the locations deemed difficult to sterilize. The areas are inoculated with Bacillus atrophaeus for EO or Geobacillus stearothermophilus for vaporized hydrogen peroxide. Each location is inoculated with a challenge of 106 spores per site and units are repackaged in their primary packaging. The inoculated products and several PCDs are exposed side by side and then tested for sterility. A series of fractional cycles are performed varying the exposure time until the most difficult location can be determined. The PCD that has equal or greater resistance than the actual product is chosen to act as the surrogate for the product. This PCD can then be used for the bioburden resistance phase, for validation, and for subsequent routine cycles at the contract sterilizer. Product Adoption is performed to “adopt” a product into a previously validated sterilization cycle by demonstrating that the candidate product is not a greater challenge to sterilization than the current PCD or other products included in the validated process. This is performed by inoculating the candidate devices in all of the locations judged difficult to sterilize with spores of the appropriate indicator organism and exposing them to a series of fractional sterilization cycles alongside the current, most resistant product or PCD. Following exposure, the inoculated products and PCDs are tested for sterility and the results are compared. If the candidate product is equivalent or less resistant than the current hardest to sterilize product or PCD, the candidate product may be included in the sterilization cycle. Once it is determined that the candidate product may be sterilized along with the other products based on its relative resistance, the second part of the product adoption exercise is to determine what effect the new product—in the quantities expected to be sterilized—has on the overall sterilization load. This is typically performed by looking at the temperature and humidity distribution on the first loads sterilized that contain the new product(s) and performing a comparison to the initial validation. If you have additional questions about Sterilization Bioburden Resistance testing, or would like to consult with the experts at Nelson Labs, just send us a request or call us at +1 (801) 290-7500.